Meanwhile, Bundesbank President Jens Weidmann had to admit that Germany’s economic weakness carried into 2019. The first economic indicators for January also saw little improvement for the rest of the Eurozone. The European Commission’s sentiment indicator fell back further in January. Forward-looking indicators like order books and production expectations in the more cyclical manufacturing sector don’t bode well for first quarter growth, while export order books took another hit. 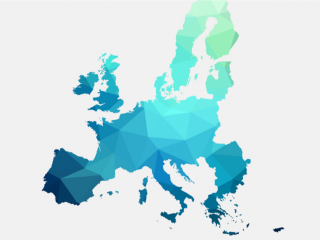 Industry mentioned a significant drop in the competitive position on foreign markets outside the EU, which is probably related to the relatively strong euro exchange rates in effective terms. It is also telling that the share of managers who see their current production capacity as more than sufficient, increased considerably in January - a warning sign that business investment might start to cool down. On a more positive note, consumers have become slightly less worried about unemployment, which could support consumption in the months ahead. 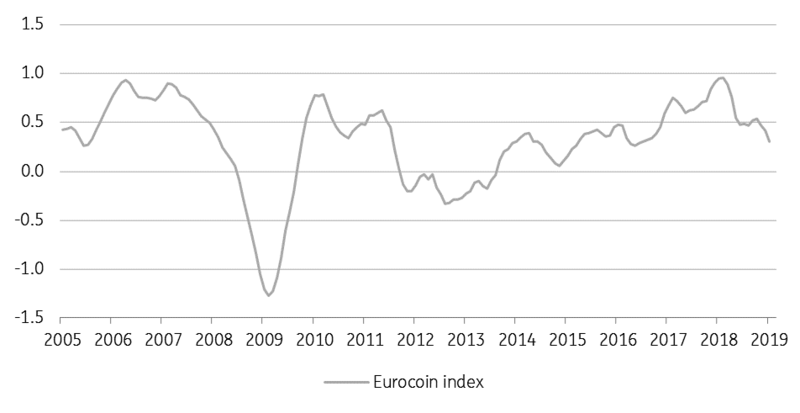 In January the €-coin indicator, a gauge of the underlying growth momentum, decreased to 0.31, from 0.42 in December, falling to the lowest level recorded since July 2016. While the first quarter is therefore unlikely to see much growth acceleration, we expect a minor growth pick-up in the second quarter. That should result in 1.2% GDP growth for 2019, revised downward from 1.4%. For 2020, we also expect 1.2% growth, so no recession yet, but definitely a slowdown from the growth rhythm we saw in 2018. 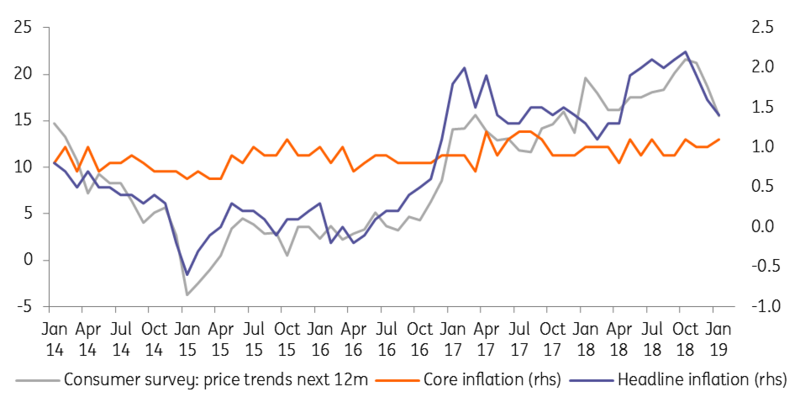 Despite the lower growth profile, the ECB is still convinced that labour cost pressures are continuing to strengthen and broaden amid high levels of capacity utilisation and tightening labour markets, which will generate an upward path in underlying inflation. A recent study from the ECB finds positive demand shocks foster this transmission, not exactly what we expect. On top of that, in an environment of low inflation the transmission tends to be slower. So, yes, underlying inflation could increase somewhat over the next 12 months, but we are probably not going to see 1.5% this year. In that light, there is no need for the ECB to start thinking of monetary tightening. However, the ECB is not entirely insensitive to the fact that the long period of negative rates and a flat yield curve is having a negative impact on bank profitability, which could eventually result in tighter credit conditions (A study on the effect of negative interest rates on credit in Sweden). In those circumstances, a ‘technical’ 0.15 basis points deposit rate hike in the fourth quarter might still make sense, although the bank could also find other means to alleviate the banks’ burden, such as remunerating a part of the excess liquidity at the refi rate. Apart from that, we are increasingly convinced the ECB will come up with a new longer-term funding operation by June to avoid an increase in the banks’ funding cost. So, in sum, we think the ECB will take measures to avoid monetary policy tightening than to embark on a tightening cycle.